ATHENS – Democratic Ohio Treasurer candidate Rob Richardson wants to bring innovation to government and an end to politics that prioritize a privileged few over the many. Richardson pointed to the seven-year long attempt by Republicans to repeal the Affordable Care Act, which he said failed because people were willing to stand up and make known their opposition to repeal. “But understand something, it only failed by one vote. One vote was the difference between 700,000 Ohioans losing their health care, over 20 million Americans losing their health care,” he said. Richardson said that President Donald Trump is bringing ideas that would harm the majority of Americans by himself but is supported in the effort by the most of the Republican Party. But this isn’t just the focus of Washington Republicans, he said. It’s been the focus of Republicans in Ohio for a long time, Richardson charged. Twenty-four out of the last 28 years have seen one-party Republican rule in Ohio, he said. Ohio is No. 1 for student debt in America, he said, because the state doesn’t invest in students and young people, making it harder to attract and retain talent. Richardson pointed to his fight against the removal of an Ohio tuition increase cap while he was student body president at the University of Cincinnati during the governorship of Robert Taft. Ohio is also No. 1 in opioid deaths in America, he said, and pharmaceutical companies haven’t been held accountable. As a union attorney, Richardson said, it’s been part of his job to sue pharmaceutical companies for overcharging. “So I look forward to being the Ohio treasurer and holding them accountable,” he said. What’s going on right now in America is a test of our moral character, Richardson said. Love of country means more than standing for the national anthem, which is important, Richardson said. Love of country is understanding how America was built, he said. He cited the sacrifice of those in the labor movement over 100 years ago representing African Americans, immigrants, and people most said at the time shouldn’t have a union and didn’t deserve representation. Their fight led to the opportunities he has today, Richardson said. Love of country is understanding that we are all in it for the long run, he said. 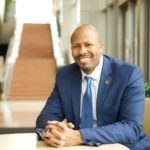 When people are denied opportunities, or not given their rights, or discouraged from pursuing their path, Richardson said he knows the harm it can cause. Richardson’s cousin, the late Vivian Malone Jones, was one of the first two African-American woman to attend the Univesity of Alabama in 1963, and the first to graduate in 1965. Doing that, she had to stand up to a governor, George Wallace, who did not want her there, and many others who did not want her there, screaming at her, telling her she shouldn’t be there.